If you were to ask K what his favorite pie was, what would you guess? Apple pie? Peach pie? Pecan pie? No, no, his favorite is chicken pot pie. And you’ll get a really good one here at The Liberty Café. This cute little bakery slash restaurant on Cortland St. serves up French cuisine using local Californian ingredients. Ever since we got the house, K and I cut back on eating out. We’ve been trying to recoup our savings as well as acquire furniture! 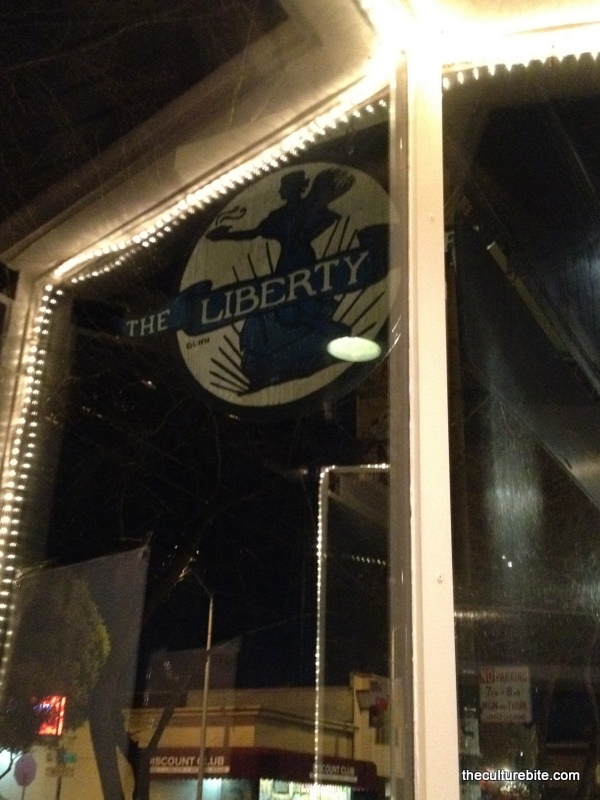 Well a few nights ago, we finally made a dinner date and tried The Liberty Café. We’ve been meaning to come here for years since everyone in my family has gone and raved about their famous chicken pot pie. When walking through the door, we were first greeted with two very friendly waiters. I had a reservation, so we were quickly seated at what I think is the best seat in the house – a table nestled within the front bay window perfectly strung with white sparkle lights. We were about to order one pot pie each, but was quickly warned by the waitress that the portions were large. Wow, how nice of her to warn us! With one chicken pot pie though, we still managed to eat an obscene amount of food. But everything was so tasty, I did not regret one bite. We started off with the night’s special, tuna tartare. 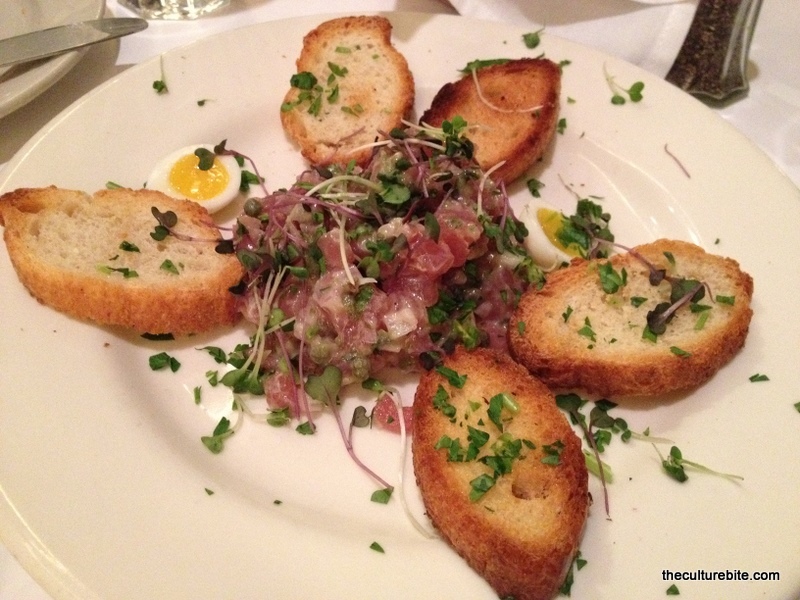 Little pieces of fresh tuna were mixed with shallots, capers, micro greens and a little quail egg split in two. The dressing was very light and I think I tasted a hint of mustard. The tuna was also served with crusty crostinis. I was really impressed with this dish. I noticed that the chef put a lot of thought into the ingredients of the dish because the the shallots and capers were diced very small so that their pungent flavors wouldn’t over power the tuna. 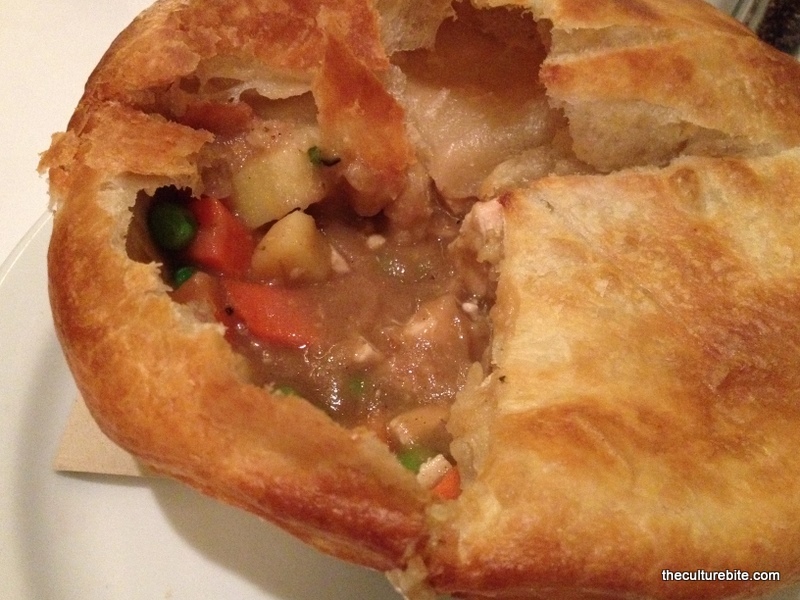 Next, was the star of the night… chicken pot pie! The pie was perfect. The gravy wasn’t too salty and it had a thick consistency. The carrots, potatoes and peas still had a slightly firm texture which meant that this pie was made to order. These babies were definitely not pre-made and frozen. 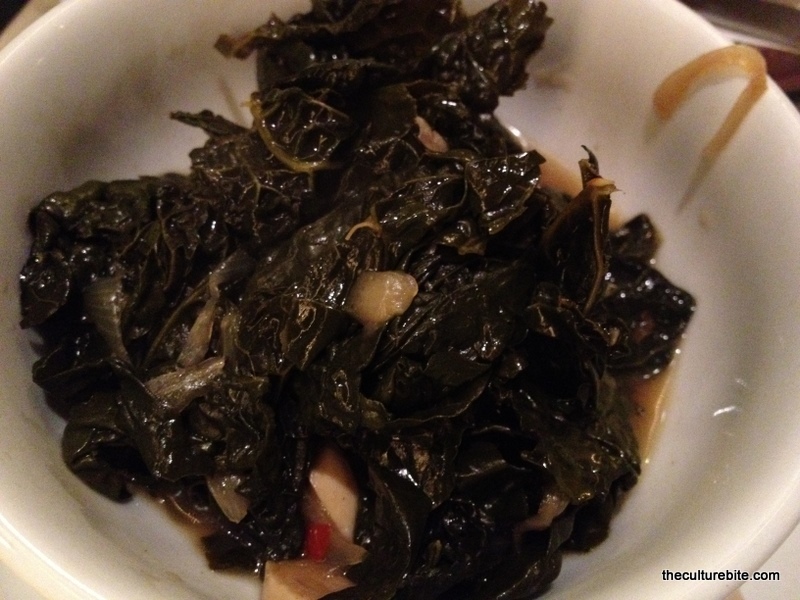 Our side of kale was super tasty too. You can’t go wrong when it’s sauteed in garlic! Alas, we come to dessert. Banana cream pie with 6 whole inches of homemade whipped cream. The bananas were thick cut and fresh. 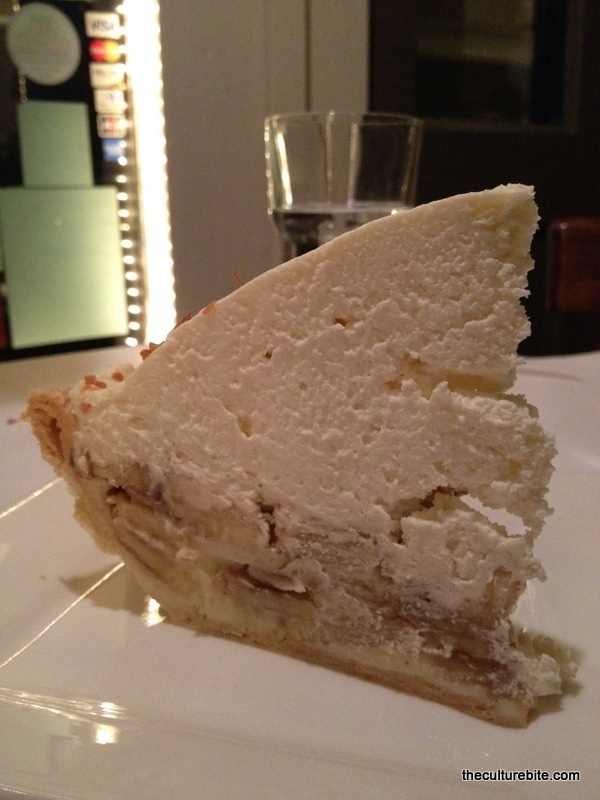 The crust was thin and flaky, and though the whipped cream looks heavy in the picture, it was light and airy. Well, I think K and I found our new date spot at this well-established café in Bernal Heights. The place is quaint, romantic and yummy. 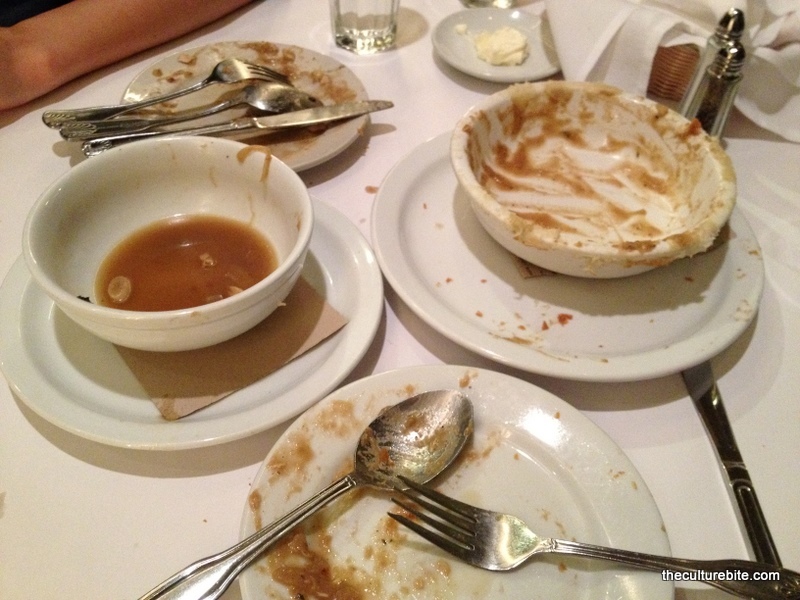 Check out our cleaned plates!